Democrats in Pittsburgh voted Tuesday for the incumbent — Mayor Bill Peduto — to be their party’s nominee for mayor, likely giving him four more years as the city’s chief executive. Peduto beat out challengers Rev. John Welch and Councilwoman Darlene Harris, getting 69 percent of the vote to Welch’s 18 percent and Harris’ 13 percent, with 99 percent of precincts reporting at midnight Tuesday. Peduto will be on the ballot for the Nov. 7 general election, in which he is not currently facing any challengers. An incumbent mayor has not lost in Pittsburgh since 1933, and this year was no different with Peduto grabbing more than two-thirds of the approximately 38,000 votes cast. In his victory speech, Peduto said “the people of Pittsburgh have spoken,” and that they had delivered a mandate to continue the progressive policies of his first term. Voters also picked candidates in contested elections for Pittsburgh City Council and School Board, as well as local and state judgeships. Anthony Coghill defeated Ashleigh Deemer in the only contested City Council race, winning the nomination for the District 4 seat that represents the South Hills. Dan Gilman ran uncontested and will represent District 8 — Oakland, Point Breeze, Shadyside and Squirrel Hill — for another term. Voters picked five new members of the Pittsburgh School Board, four of which won contested races. Sala Udin, Terry Kennedy, Cynthia Ann Falls, Veronica Edwards all defeated opponents to win the Democratic nomination and Sylvia Wilson won unopposed. Not up for re-election this year, Lynda Wrenn, City School Board Member for District 4, exuded confidence in Peduto’s impending win. As a whole, the atmosphere at Peduto’s campaign after-party as election results rolled in confirming the mayor’s primary victory was subdued prior to the candidates’ arrival. Far from giving off the feeling of tense, election-night drama, the gathering felt more like a typical reunion for long-time political friends and allies. Wrenn referenced her long-standing professional relationship with Peduto, beginning in 2001 when he won an election to represent District 8 in City Council and she was involved in several of Point Breeze’s neighborhood organizations. Peduto’s political career in Pittsburgh began in 1996 with his appointment as chief of staff to then Councilman Dan Cohen. He was elected to a term on City Council in his own right starting in 2002, before being re-elected in 2005 and 2009. He won his first term as mayor in 2013 following incumbent Luke Ravenstahl’s unexpected withdrawal from the race. 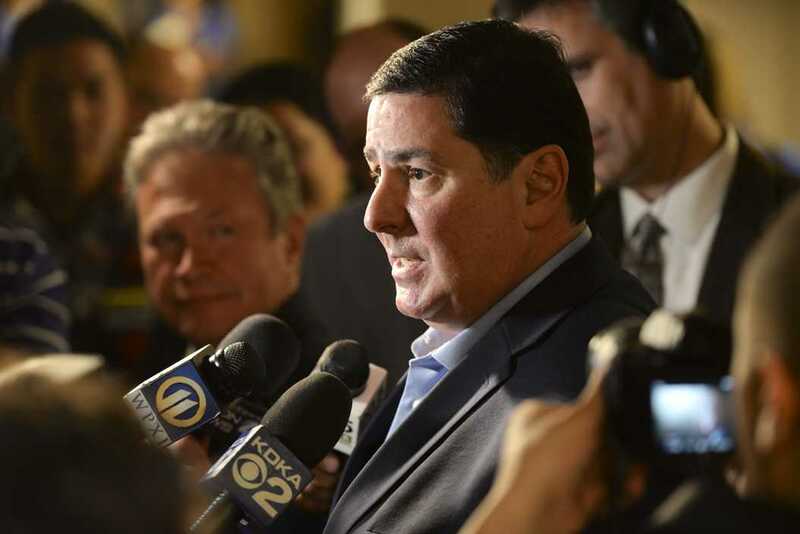 Peduto has focused largely on partnerships in his first four years as mayor, he said in an interview with The Pitt News. He mentioned a summer youth employment program that he expanded during his first term. The city partnered with the county, foundations and corporations to increase the program from employing 150 kids to 16,000, he said. “We’re now at a point where we’re almost at where every kid that wants a summer job gets a summer job but it’s because of that partnership,” he said. Welch often attacked Peduto from the left on issues such as affordable housing and criticized the mayor’s close relationship with Uber. Welch, who supported Peduto in 2013, said in a concession speech that Peduto should learn a lesson from the number of voters who opposed his re-election this year. Peduto’s victory, with around 69 percent of the electorate’s support, is significantly higher than his narrow win with 51 percent four years ago. Still, Welch pointed out that not all voters supported the incumbent. Harris, a member of City Council for the past 11 years, is a long-time adversary of Peduto. Many of the issues she focused on in her campaign — for which she claimed to have raised zero funds — were criticisms of Peduto, namely his traveling and fondness for bike lanes. In an interview on May 15, Harris said she would be a “hands-on” mayor compared to Peduto. No Republicans ran in their primary so Peduto will likely run unopposed in the Nov. general election. Pittsburgh hasn’t elected a Republican mayor in more than 80 years and in 2013, Peduto defeated the Republican challenger with 84 percent of the vote. Looking forward to his next four years in office, Peduto presented a vision for further progress on the issues he had pushed in his first term, as well as new issues facing the city. “It’s time to take on even bigger challenges,” he said.